After Tarzan-ing through Puerto Rico’s tropical forest, we freshened up on the ship and headed back out into the city of San Juan. We opted out of a ship excursion because we craved an authentic feel for the place. But we’d already discovered that the guidebooks we bought were lacking in any real content, context, and depth. Sure, opening hours, prices, and addresses were listed, but with a limited time to get to know a place, you need a guidebook that’s going to teach you at least a little bit about the culture and history of a place, not just spew Googled factoids. 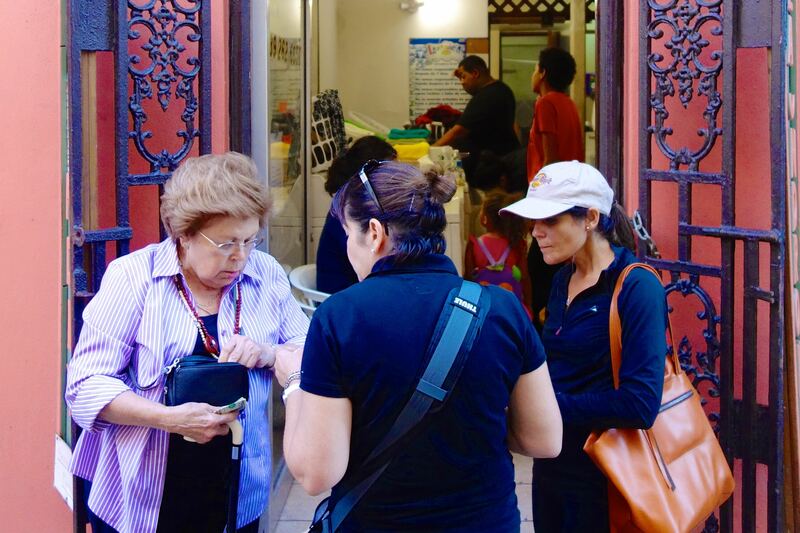 Our great tour guiding cabbie, Ariana, takes us all around her hometown of San Juan. We hired a taxi and asked our driver to give us a “guided” tour of the town. 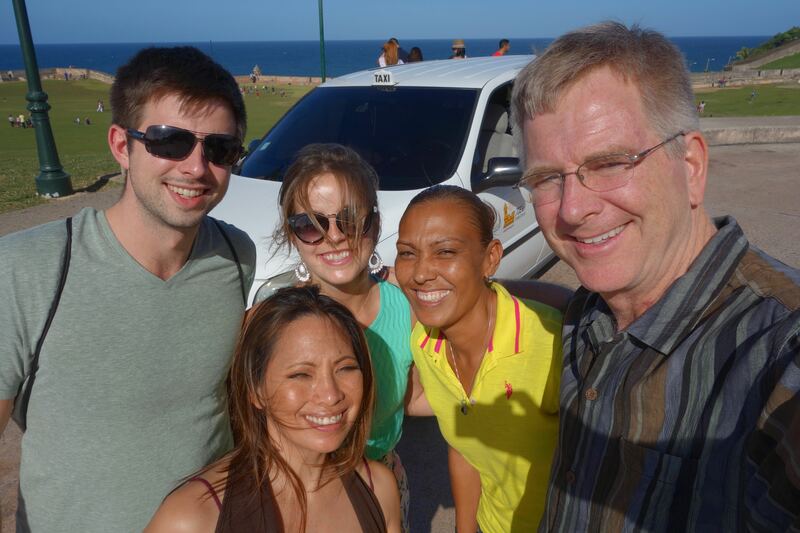 We spent $80 for two hours with our San Juan resident and cabbie, Ariana (that’s just $10/person/hour). She took us from the downtown touristy area of Old San Juan through the government district. We explored the Condado neighborhood in New San Juan and took a coffee break at the humble covered market Mercado Santurce. You come here if you want fresh-picked coconut and bananas, almost obscenely gigantic vegetables, tightly rolled cigars, super-strength coffee, and a dose of boriqua daily life (Borinquen was the pre-Spanish invasion name of the island). 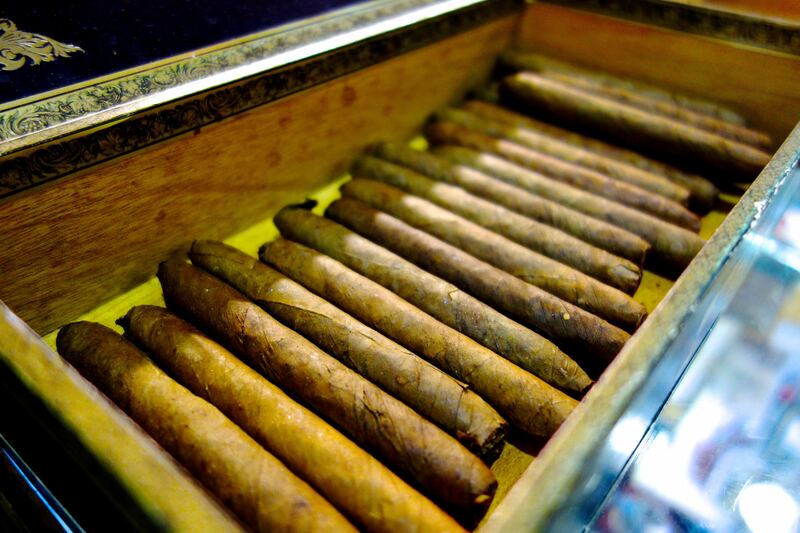 Mercado Santurce offers everything from cigars to coffee to freshly picked produce. As a U.S. Commonwealth since 1952 (previously a U.S. territory since 1917 and under Spanish rule prior to that), Puerto Ricans–who are, of course, U.S. citizens–enjoy the same benefits as mainlanders, such as federal assistance, globalization commerce, and a stable democracy. Still, P.R. retains its own brand of relaxed island flair. That has its pros and cons. We bombarded Ariana with direct questions about her country’s economy, political scene, unemployment, education, hopes, and struggles. I thought she’d pull punches, but she was open and frank about the island nation’s realities and was visibly glad that tourists would take a genuine interest in her life and that of her countrymen. 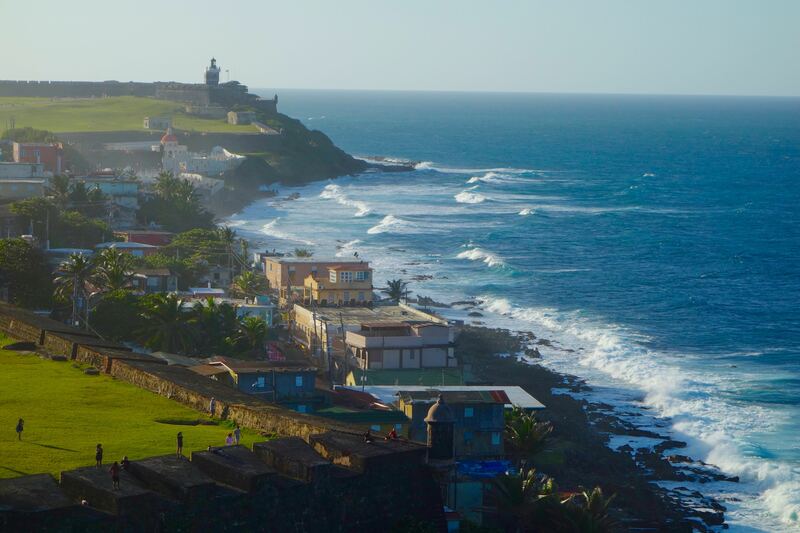 The beautiful island of Puerto Rico thrives on industries like tourism, pharmaceuticals, and manufacturing. While Ariana works nearly 60 hours a week to support her family, she acknowledged that there are fellow boricuas who take advantage of a system that provides many subsidies for housing, food, utilities, and basic necessities. Life can be good here despite not having stable work. “Everything” is paid for by the federal government. She remarks, “Is that really much different than big businesses that come here for subsidies in the form of tax breaks and government assistance for tourism, manufacturing, research, and pharmaceuticals?” I don’t know, but it does make you think. San Juan’s neighborhoods are full of people whose families have lived there for generations and of new arrivals from nearby islands. History, tradition, decay, and hope. 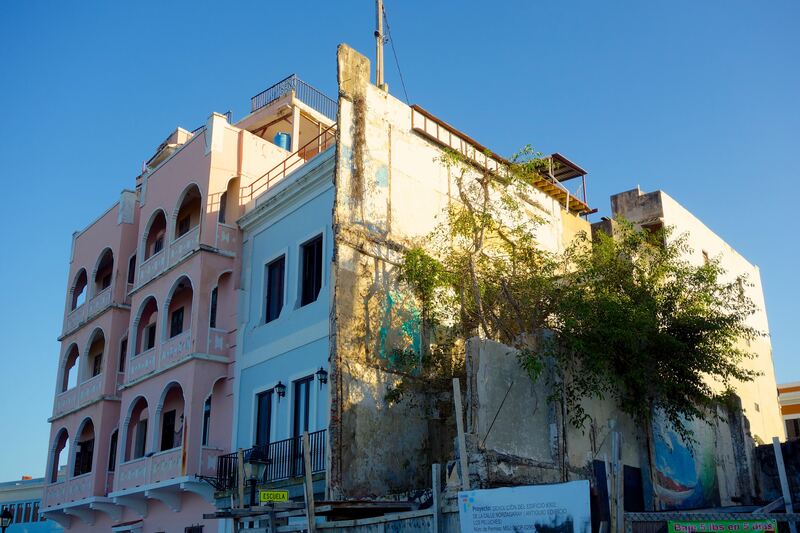 We wound our way to white sand beaches, through bustling commercial boulevards, pristine neighborhoods, rough and tumble projects, and historic districts. Tradition and historical status prevent renovations and new constructions. Antique buildings, wanting for more TLC than they’re accustomed to, had long crackled under the Caribbean heat and briny air. Bright yet fading pastel façades seemed to echo a nostalgic, Spanish colonial past while retaining a warm optimism particular to Latin America. An elegant apartment building shouldered an abandoned and semi-demolished structure. Despite its evident neglect, life and hope seemed to cling to it and to the strange, massive tree that had grown through its center. 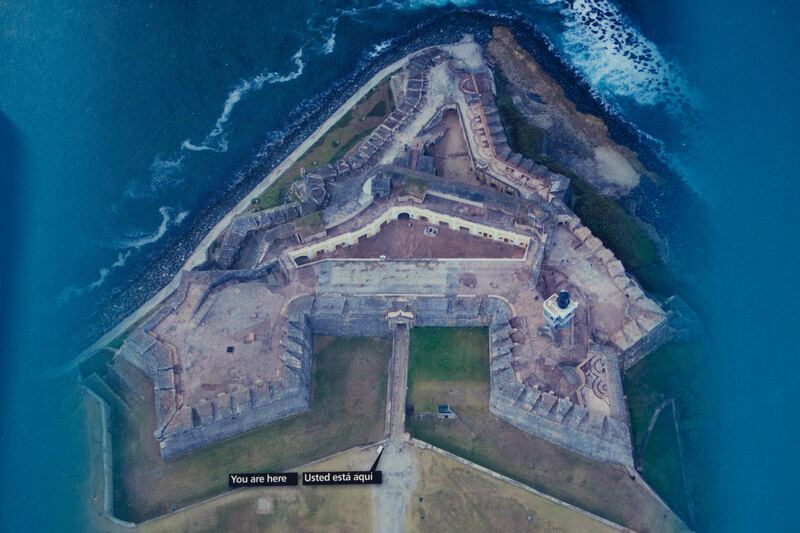 Aerial view of El Morro, one of the oldest forts in the western hemisphere. 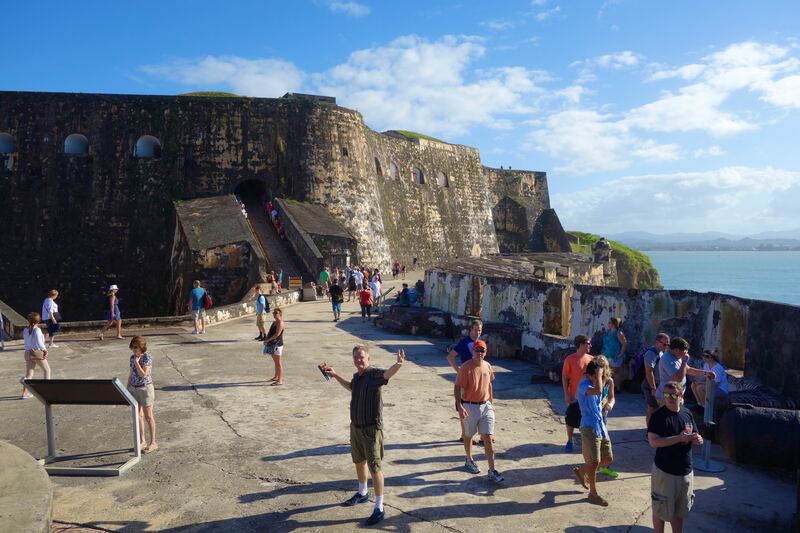 The only people “attacking” the five-centuries old Spanish fort these days are tourists. Ariana dropped us off at the former Spanish fort Castillo San Felipe del Morro, or El Morro, one of the oldest forts in the Western Hemisphere. Puerto Rico, was a strategic location where ships could restock their necessities on the their way to “The New World” or back to the motherland. And Spain had needed a mammoth fortress there to defend its newly gained lands. Wandering along its massive walls (some of which date back to 1589), through soldiers’ quarters, and up into the lighthouse, it was easy to visualize Spaniards watching for nearby vessels, intimidating would-be enemies, and firing cannonballs at U.S. warships during the Spanish-American War. Now, the only battles fought on this famous San Juan site are between tourists squeezing by each other in tight spaces. Having fed our hunger for sightseeing, we hungered for some local food. Rick, Jackie, and I went on a mission to find a non-touristy place for dinner–a challenge but a manageable one. Andy decided to get a haircut from a local barber, and we’d text him with our restaurant location. As with any tourist destination, if you leave the busy streets and meander along the smaller back streets and side streets, you’ll often find where the locals are hanging out and discover authentic meals for local prices. It was the savory scent of pork that stopped us in our tracks. The entry way looked nothing like a restaurant. Rickety stairs led to a fluorescent lamp-lighted, turquoise stuccoed hole-in-the-wall, and locals filled all six tables. 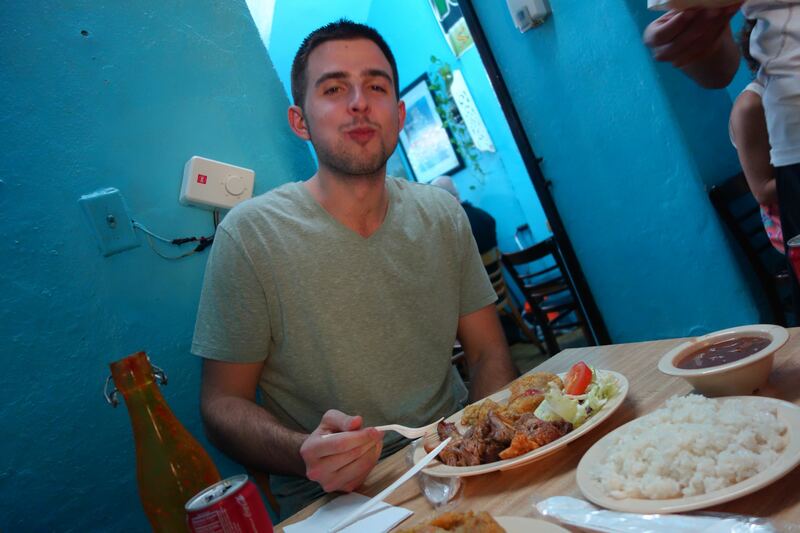 Los Yeyos would be our Puerto Rican food mecca, and it looked worth the wait. 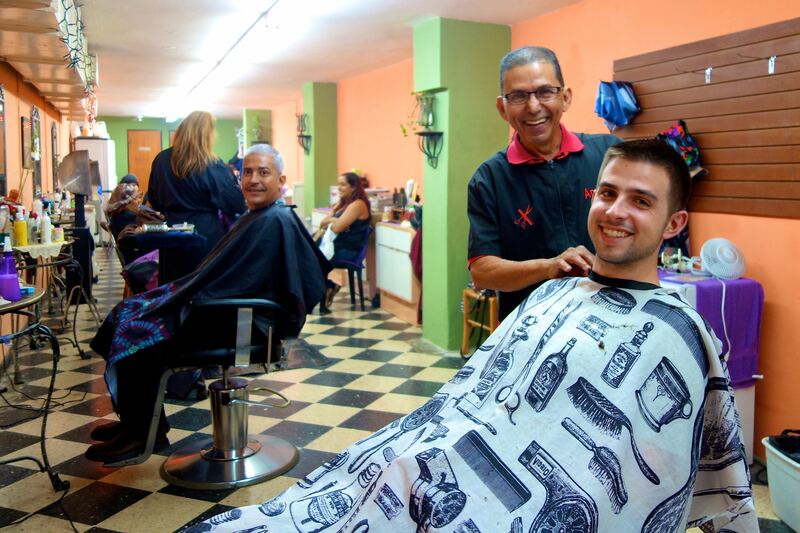 Travel tip: Get a haircut at a local barbershop or salon. Like Andy, you’ll make new local friends and look good doing it. To kill time, we went to find Andy. While he speaks very little Spanish (his forte is Italian), he was having a grand old time with his new friend, the barber. It was cool to see him engaged with the locals and doing what residents do there every day. More than a place for a haircut, it was a social gathering where they could catch up on the latest news, gossip about friends and neighbors, and visit with the barbers and hairstylists that they’d grown up with. 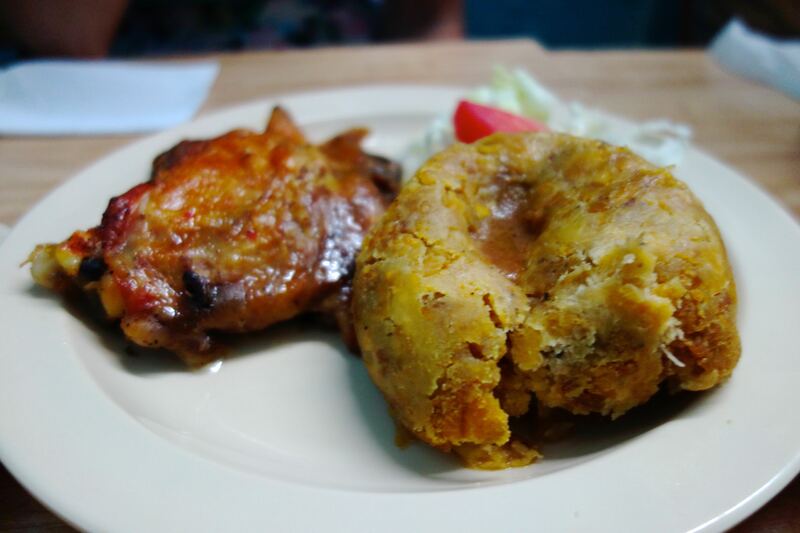 Spiced chicken and mofongo are a perfect combination and a traditional favorite among San Juan locals. Mouths and bellies full of tasty local dishes, we left Los Yeyos happy. We ordered exactly what was recommended to us, and our mouths and bellies were thankful. The spices served as potent reminders of P.R.’s trading outpost history with Spain and the Old World, while the sweet, tropical flavors reinforced the notion that Boriqua cherishes its own distinctiveness, too. Feeling full and well exhausted from our 12-hour adventure in San Juan, we made our way back to our ship. Big comfy beds awaited us. We slumbered soundly as rolling waves rocked us gently across the Caribbean and on to our next port. Keep following The Travelphile for more stories about our family cruise to the Caribbean.